STILL SEARCHING FOR THE PERFECT LETTERING BRUSHES FOR PROCREATE? Stop looking. I got you! With this Procreate brush set I can promise you have found the perfect brush set to letter realistic using your iPad Pro and Procreate. Smooth and textured styles for variety that looks like you lettered on paper. Realistic lettering with settings for even the most shakiest of artist hands. Procreate brushes to save you tons of money on ink and paper - start making money instead! These brushes are for Procreate 4+ and work best with the iPad Pro and the Apple Pencil. If you use different devices or older versions of Procreate I cannot guarantee these will work. Purchase at your own risk. These brushes do NOT work in Adobe products. Yes, you may use my brushes to letter artwork for sale. 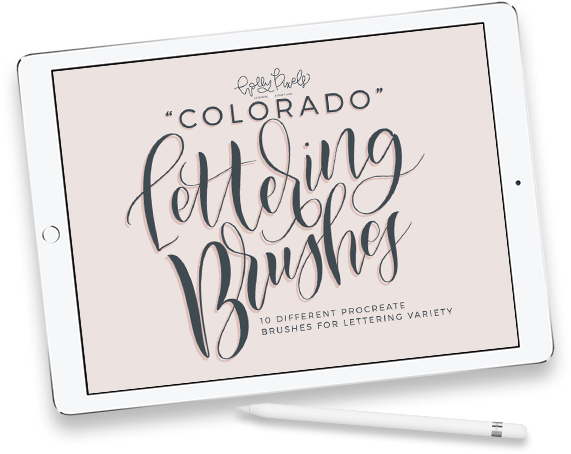 Colorado comes with 10 Procreate Brushes for lettering variety. My signature set of brushes are popular among lettering artists. Above are videos to help you with installing your Procreate Brushes. If you have problems with your brushes use my Help Page to get support Monday through Friday from 10 a.m. to 4 p.m. MST.